In a move that has stunned staff at Sealaska Heritage Institute (SHI), a family from Seattle has given a valuable, ancient Chilkat robe to SHI in an effort to return it to its ancestral home and repatriate it to tribal people. The donors, who wish to remain anonymous, chose SHI in part because it has a robust arts program through which it teaches Northwest Coast arts in an effort to perpetuate ancient practices. A donation of this magnitude is unprecedented at SHI, and the donors’ generosity has elated staff, said SHI President Rosita Worl, noting that current and future generations of weavers will now get to study this robe made by their ancestors. The process of donating the blanket started when a daughter in the donating family noticed a similar blanket in her AP art history textbook. It was featured there as an important cultural piece as well as significant in the history of art. She then vigorously (and successfully) lobbied her parents to return it to its appropriate owners, the family wrote. SHI will celebrate the robe’s return in a public ceremony scheduled Saturday, Aug. 26, at the Walter Soboleff Building in Juneau. Everyone is invited to attend. 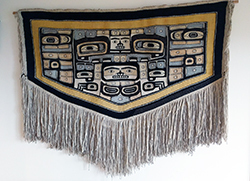 The donors purchased the robe in the 1990s, and at the time, an opinion on the piece was offered by Bill Holm, a nationally-recognized expert on Northwest Coast art and formline design. Holm in 1995 estimated it was made around the turn of the century or perhaps in the early 1900s and noted it was very similar to two robes featured in the book The Chilkat Robe by George T. Emmons. Emmons thought the robes in the book depicted an osprey or thunderbird standing with outspread wings, but the noted anthropologist John Swanton believed they depicted a beaver with alder—its food, Holm wrote. Holm said he tended to favor the interpretation of a bird, rather than a beaver, but that “either interpretation can be defended.” A Northwest Coast art expert who studied a photo of the robe on SHI’s behalf thought it might depict a Raven because the beak is not curved. Holm noted the robe donated to SHI differs only in detail from the robes in Emmons’s book but that some of those details are unique to the robe. Holm also noted that the robe was in good condition and showed little fading. Chilkat weaving is a very complex art form that is unique to Northwest Coast cultures, and in recent years, it was considered to be an endangered art practice. A few Native artists mastered the craft and are now teaching it to others, giving hope this ancient practice will survive. Weavers note that it’s essential to have access to the old robes to study the techniques and materials used by their ancestors. The robe will be stored in Sealaska Heritage’s climate-controlled vault and made available to weavers for study. SHI also will house Holm’s paper on the piece in its archives.